« It’s Indianapolis 500 Race Day At IMS! What a strange race that was! It was like three races put together that had no rhythm. But what a finish over the final twelve laps! The first segment of the race was dominated by Tony Kanaan. He moved up from his Row Three starting spot in typical Tony Kanaan fashion, by passing cars on the start. he took the lead from his teammate, Scott Dixon, on Lap Six. He led the next twenty-two laps until his first pit stop. Surprisingly, Kanaan never led another lap. He spent most of the day between fifth and seventh and finished the day in seventh. Once the pit stops cycled through, the lead went back and forth between last year’s winner, Alexander Rossi; and this year’s rookie sensation, Fernando Alonso. As the halfway point approached, Ryan Hunter-Reay joined in the mix and the three of them went back and forth swapping the lead. You figured that the winner would come from one of those three. That would be wrong. Ryan Hunter-Reay was the victim of one of the costly Honda failures we were expecting. Just as he was battling for the lead, Hunter-Reay’s engine expired on Lap 137. Charlie Kimball’s Honda failed on Lap 167, but the cruelest blow came on Lap 180. That was when the car of Fernando Alonso slowed down on the main straightaway as his Honda engine let go. That set up a very interesting scenario that had Max Chilton leading with Takuma Sato, Ed Jones and Helio Castroneves to battle for the win. But there was a five-car accident heading into Turn Two involving Will Power, James Hinchcliffe, Josef Newgarden, Oriol Servia and James Davison. On Lap 188, Helio Castroneves and Takuma Sato both went on a tear. Within a few aps, they dispensed of Chilton and Jones to make it a two man battle for the win. Helio passed Sato on Lap 194 to take the lead, making everyone think he was well on his way to becoming the fourth member of the Four-time Winners Club. But Sato passed him back on Lap 195 and never relinquished the lead. In 2012, Sato crashed on the last lap of the race going for the win while battling with Dario Franchitti. He may have cashed and lost the race, but he won the respect of many fans by going for broke. 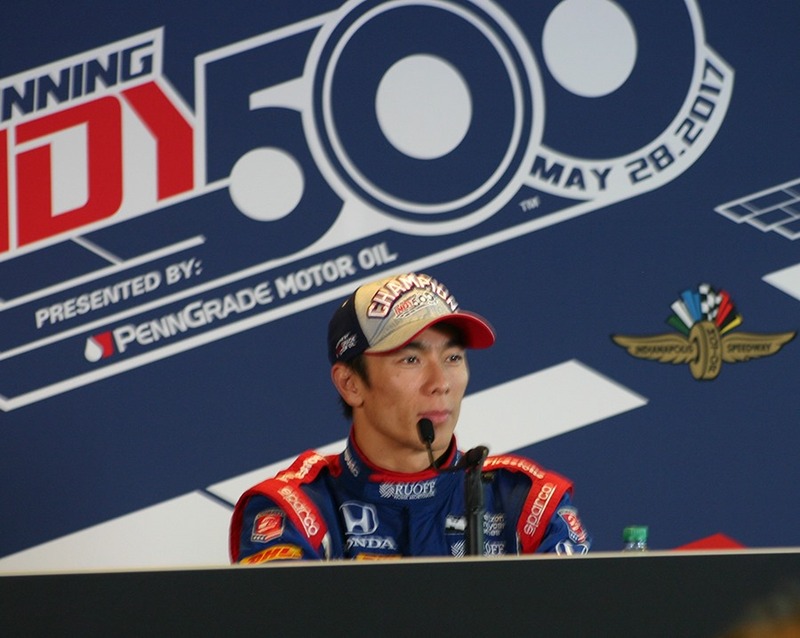 Fans love watching Sato because he is never content to ride around and earn points. He is always trying to win. Unlike that day in 2012, no one booed this winner. A fourth Helio Castroneves win may have been more popular with a lot of fans, but many felt that Sato had paid his dues at this track and had certainly earned the win on this day. He was one of the most jubilant winners I’ve seen interviewed after the race. Sato, Ziggy Harcus and Michael Andretti were all ecstatic. They should have been. It was a very good win. Of course, there was the attrition with some hard and frightening crashes. The most frightening looking was the accident on Lap 53 involving Jay Howard and pole-sitter Scott Dixon. The car of Dixon flipped and struck the inside wall in a spectacular crash that saw both drivers walk away. Another hard hit involved a one-car accident involving 1996 Buddy Lazier. He was transported to Methodist Hospital and I’ve heard no updates since. This will do it for now. It’s been a very enjoyable Month of May and I can’t believe it’s over. There will be no post tomorrow, since it’s a holiday. But I’ll have my “Random Thoughts” post here on Tuesday. We will be travelling back to Nashville on Monday. I hope everyone enjoys your holiday on Monday. Check back here on Tuesday and thanks for following along all month. This entry was posted on May 28, 2017 at 5:46 pm and is filed under Indianapolis 500. You can follow any responses to this entry through the RSS 2.0 feed. You can leave a response, or trackback from your own site. I found a theme about the 101 , The new guy sung a old song and the crowd loved him with a new rich sound of Back Home Again in Indiana .With the month of May having most of the race fans of Europe tuned into the Indy500 was a plus for the series . Just the minute that the Alonso story was done for the Month the eyes of Japan is watching one of their guys win the Indy 500 . Old & New was the theme . Happy for Sato, unhurt drivers (well, still waiting for an update on Lazier), Back Home Again, and a dry track. Not happy about the end of “ladies and gentlemen, start your engines”. Thanks George and Susan for all of the reports–it makes the event all the more special, especially for those of us that cannot attend. Congrats to Sato–he definitely earned the victory. I thought he showed real class in his radio interview where he thanked the Foyt team for four great years of learning experience which he said helped him this day. Am also thankful that no one was seriously injured–an unbelievable blessing given Dixon’s incredible crash. Until next year! Thank you George and Susan for your coverage of the Indy 500 on the blog. Here’s looking forward to the next episode of “One Take Only” to find out about John Mc’s take on this race.